Get identified in style now! Print professional photo ID cards for your employees through us and get them customised with your company name and brand logo on it! With us, you can design ID cards online and also have an option of printing your ID cards on a single as well as both sides (front & back). Note: We do not print Identity Cards for large corporate clients without an authority letter. We also do not print any Government ID Cards / Pan Card / Aadhaar card / Driving License. Add benefit to your business through our custom designed employee ID Cards. Identification is an important factor. An employee ID card gets you the kind of accommodation and adaptation you need to perform your job better. After all, it is always a nice feeling to be called by your own name and especially for companies with a lot of employees, this helps. This is when employee ID cards come to your rescue. Having a company ID card for all the employees in your organisation brings in a sense of togetherness and provides security to your workplace. As a result the employees feel a sense of belonging towards the company. With PrintStop, you get photo printed ID cards online, which can be turned in to smart cards, allowing you to double your company's security and togetherness. Our employee ID card printing services are quite popular and used by many organisations. An ID cards printed online at PrintStop enhance your organisation's integrity. Plus, our online ID card maker helps you customise your employee ID cards with your company name, photo, address along with your brand logo. This results in giving your employee ID cards a professional and an authentic look. If you're running a huge business or own a big company, you can also have a passcode for every ID card to keep a track of each employee's in and out time. This results in employees knowing each other by their names and bonding well. You also avoid possible spelling mistakes and misunderstandings. A sense of unity arrives with an employee ID card and everyone works in harmony in your organisation. Our ID cards printing service is tailor-made. You can make an employee ID card online with our online ID card maker and customise every single ID card for your employees. This can help improve your employee-customer relationship and boost your business. Imagine your employees traveling through streets and trains to meet their clients and people seeing their identity cards, thus, seeing your company name as well. This results in indirect marketing for your brand. Let your employees flaunt your custom printed ID cards at public events, exhibitions, and other office events to market your business. This results in effective and inexpensive branding. 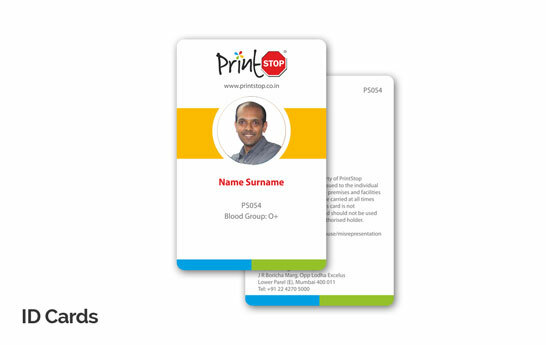 The employee ID card designing process is simple at PrintStop. You can use our online ID card creator, upload your own company ID card design online or get it custom-made through us. Our graphic design team Pehchaan creates stunning employee ID card designs online based on your specifications. We include your own corporate colours with attractive fonts and layouts and come up with a draft. If you approve it, then we print ID cards online and deliver them to your doorstep. Get your custom ID cards today! Visit PrintStop is the place to go for all your office stationery requirements. Place an order with us! Contact us now.